The Hand and Shears is a charming, atmospheric pub, that is stocked full of character and history. 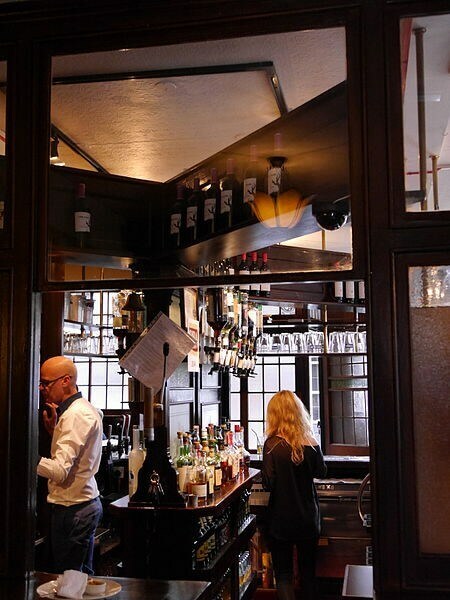 Located on ‘Middle Street’, a street that connects the Smithfield and Barbican areas of central London, the pub is only a 10-minute walk from St Paul’s Cathedral. In fact, the pub is located directly between the historic Smithfield Market and the Barbican Centre, but that doesn’t mean you can’t unwind here. Order a drink and enjoy the surroundings on offer, they haven’t changed for 170 years. Some pubs might have a bombastic, bloody or even haunting history and claim to be favourite drinking spots of Dickens, however, The ‘Fists and Clippers’ as it’s known locally, is a more gentle affair. This part of London is well known for its pubs and history. 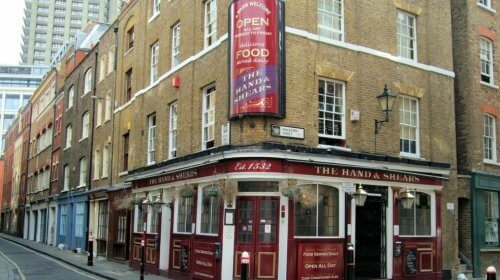 The winding streets offer many hidden hostelries to visitors and locals, however, The Hand and Shears is certainly one of the oldest. It is reputed that there has been a pub in this location since the Middle Ages, and it’s likely that there has been, that said, the date above the door states 1532. Obviously, this isn’t a reference to the current building, as it’s Georgian, but certainly the area has seen it’s fair share of history. 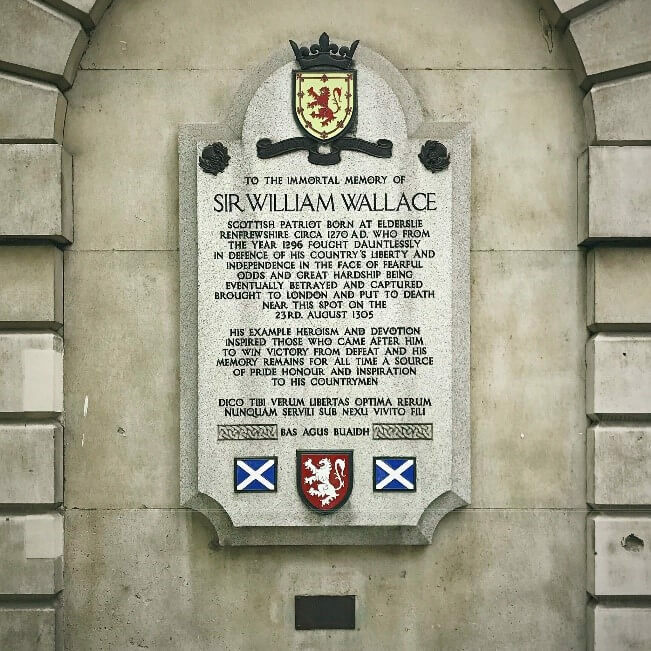 The pub isn’t far away from the spot in Smithfield that Sir William Wallace, the Scottish Knight and one of the leaders during the first war of Scottish Independence, was hung drawn and quartered in 1305. You might remember the 1995 film Braveheart that starred Mel Gibson and focused on the Sir William Wallace story, despite some inaccuracies. Named after a gate in the London Wall and a name for the region of the City of London outside the gate, the Cripplegate area was bombed so heavily during the Blitz of World War II, that it was virtually rubble except for a few buildings. In the 1950’s it was decided that the area would be redeveloped. The result was a brutalist architectural masterpiece, The Barbican Estate. Following on from this, The Barbican Centre was built and quickly established itself as an important cultural hub and arts centre in London. The pub itself has regular customers and is often sought out by curious tourists who have read about it either in books or across websites. 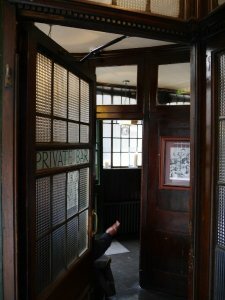 You can still find copies of a book called ‘City of London Pubs: A Practical and Historical Guide’ by Timothy M. Richards and James Stevens Curl, selling online. Published in 1973, the pub is declared (to be) “relatively unspoilt…an excellent example of a traditional nineteenth-century pub’’. Nearly 50 years on and the case remains the same as you can see from the picture of the pubs interior. The wood paneling is prevalent throughout, the pub even features polished wooden flooring and original tiles on the door steps as you enter. The central island bar plays host to both the Public and Private bar. Although, rules nowadays are slightly more relaxed. See the entrance on the corner of the building, with the curved door and the side entrance, although multiple entrances on pubs aren’t unique, in the case of The Hand and Shears, they certainly add to the character, allure and traditional nature of the pub, just like the name itself. Judging by the name of the pub, if someone was to tell you that they’d been drinking in The Hand and Shears, you’d be forgiven for believing it to be out in the sticks somewhere, least of all in the middle of London. The reason for this unusual, yet traditional sounding name, is because the building was used by cloth merchants to settle arguments, set up deals and rectify disputes of the merchants who attended the St Bartholomew’s Fair. The pub played an important part in proceedings with licenses being granted from the premises and the Lord Mayor even opening the Fair from the pub’s door way. If you’re ever around this area of London, and fancy finding somewhere a little different, a pint in The Hands and Shears could be a very good idea indeed!